David Lindsay's A Voyage to Arcturus was first published in 1920, and not reprinted until 1946. 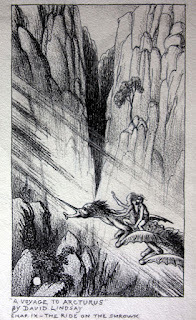 At some unknown point, an illustrator who signed himself "Hugh Deane" did an illustration titled "The Ride on the Shrowk" for chapter IX. The illustration itself is unsigned, but on the back, in the same hand as the text below the illustration, it reads: "Please return to / Hugh Deane / 6 Stonor Road / Kensington W14"
"Hugh Deane" doesn't appear in reference works on artists, nor can I find biographical details using the usual genealogical resources. I suspect "Hugh" might be the artist's nickname, or middle name, and not his legal name. A search on the web turns up some additional information. Bromer Booksellers of Boston currently have for sale an original watercolor of Henrik Ibsen and Four of His Heroines by Deane which they date to "1925" (copied at right; the link to the seller's entry is here), and they state that "Hugh Deane was a Kensington-based artist, known primarily for his work on magazines and periodicals of the 1920s and 30s." Yet I can find no examples of his published work in the 1920s or 1930s. I can find one example from the mid-1940s, a book Ten Little Chelas (1947), with verse by Michael Juste and illustrations by Hugh Deane, published by the Atlantis Book Shop. 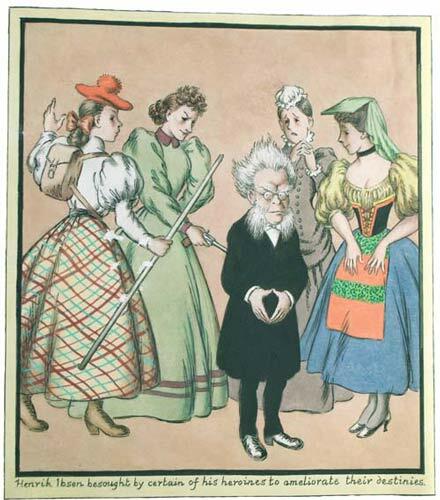 And a 2005 auction of some of Deane's illustrations and portrait caricatures, including a frontispiece for Hoffmann's Nutcracker, lists them as "c. 1920-1925". However, the associated hand-drawn title page for Hoffmann's Nutcracker gives the proposed publisher and proposed date as The Neptune Press, 1947. The only actual publication I have discovered by Neptune Press is 777 Revised (1955) by Aleister Crowley. Thus with two items able to be dated to 1947, I suspect that the illustration for A Voyage to Arcturus also dates to around 1947, not long after the book was reissued in August 1946. If anyone has further knowledge of Hugh Deane to share, please write in. The Arcturus illustration reminds me of a Sime. Never heard of this before but very interesting. I see what you mean in terms of composition, and in the mountain shapes and the trees. A Sime-illustrated Voyage to Arcturus is one of those great books that should have been! That would have been tremendous! Who could do it justice now? It's anazing what turns up. A friend of mine bought what she thought was a print but on closer inspection was an original,almost certainly by Sime according to ST Joshi and others.It might be worth contacting the Atlantis Bookshop as the owner, Geraldine, knows a lot about its past.Btw, there was an amateur film of Arcturus some time ago. I just found the Sidney Sime website two days ago. I have long thought David Lindsay never had a great artistic interpreter (Robert Pepper being a one-shot) and for whatever reason, after seeing more of Sime's color work, it occurred to me that Sidney Sime would have been perfect. So I searched Sime and Lindsay, and that led me here! So much for my original thought! And by the way, after a promising start, the Arcturus movie (on youtube) proved to be more ambitious than successful. But I did finish it, so it did enough to hold my interest. Now, if Christopher Nolan would just stumble across The Night Land.